Erbil, Kurdistan Region, Iraq (cabinet.gov.krd) – Kurdistan Region President Masoud Barzani met with a senior American delegation headed by Secretary of Defense James Mattis in Erbil. According to the official website of the Kurdistan Region Presidency, President Barzani and Secretary Mattis reviewed the ongoing operations against the so-called Islamic State terror group as well as recent developments. Secretary Mattis saluted the Iraqi and Peshmerga forces for liberating the city of Mosul and their victories against ISIS. He conveyed his condolences on behalf of the United States military to the families of the fallen Peshmergas. President Barzani expressed his gratitude to the United States for its continued support to the Peshmerga forces, the people and government of the Kurdistan Region. The two leaders also discussed the upcoming referendum on Kurdistan’s Independence. Secretary Mattis stated that he understands the grievances of the people of the Kurdistan Region; however, he conveyed his government’s concern that the referendum may hinder collective efforts against ISIS. President Barzani stated that holding referendum is a natural right of the people and does not contradict with democratic and human rights principles. He listed major constitutional violations committed against the Kurdistan Region by the central government of Iraq. The President also reassured Secretary Mattis that the referendum would not impede operations against ISIS, whom the President branded as brutal and common enemy facing all of humanity. The United States delegation included Brett McGurk, the Special Presidential Envoy for the Global Coalition to Counter ISIS as well as a number of military and diplomatic officials. 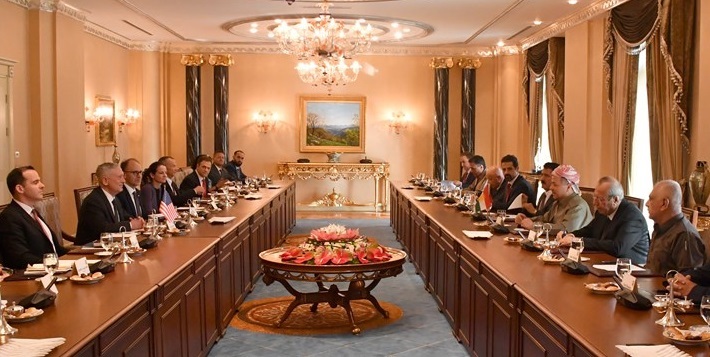 President Barzani was joined in the meeting by Vice President Kosrat Rasul Ali, Deputy Prime Minister Qubad Talabani and a number of military and governmental officials. Erbil, Kurdistan Region, Iraq (cabinet.gov.krd) – Kurdistan Regional Government Prime Minister Nechirvan Barzani says that improving education remains a main priority of his government. Mr. Barzani made the remarks during a conference on education, organized by KRG’s Ministry of Education and the United Nations Children’s Fund in Erbil on Thursday. I would like to welcome you all to this important conference in Erbil. I hope this conference will bring with it positive results that will improve the process of education and learning. I also hope it will help to enhance the education sector in the Kurdistan Region in general. I commend the Ministry of Education, Dr. Pshtiwan Sadiq Minister of Education, the staff of the Ministry of Education, UNICEF and all who contributed in arranging this conference. I especially commend and thank UNICEF for their efforts they made in conducting the studies needed for this conference. The study will outline the current state of the education sector in the Kurdistan Region and Iraq by relying on official data and information from KRG and Iraq. The study pinpoints the deficiencies of the education sector and will recommend approaches for resolving the shortcomings. Indeed, they have done a fine job, I hope that this study along with this conference will become a springboard for taking effective steps towards resolving these issues, correcting deficiencies, and improving the learning and education sector in Kurdistan Region. I trust that this study will attract more assistance and support from international organizations and agencies and international and local donors in the Kurdistan Region and Iraq as a whole. The education sector has been the KRG’s main priority since its formation. For this reason, the KRG has supported this sector to its best ability by allocating a good portion of its budget for its development. Additionally, the KRG has been continually working, so that the education sector will have a modern and sophisticated system that is aligned with contemporary international standards, principles and values. As we emphasized in the manifesto of KRG’s eight’s cabinet, we will continue the process of reform in the education sector by fulfilling the requirements and raising the scientific level of teachers, and putting emphasis on scientific research and vocational studies. These attempts will provide a capable and competent workforce to the market and reduce the illiteracy rate in the region. As such, the education sector has been a focal point of the Kurdish Regional Government. Up until Kurdistan Region’s budget was cut by the Iraqi government, the KRG had never wavered or backed away from fulfilling the requirements in the education sector. But unfortunately, the education sector just like any other sectors in the Kurdistan Region was hit by Baghdad’s refusal to allocate Kurdistan’s budget and the financial crisis, hence, the Kurdistan Region faced the adverse impacts of the severe financial situation that was imposed on the Kurdistan Region. Inevitably, with regret, the budget and financial support were reduced for the education sector. Certainly, the allocated budget for the education sector is less than what should have been allocated, however, it is positive to learn from the result of the study which will be presented to you, that the state of education in the Kurdistan Region is still superior to that of Iraq. Education is improving at a faster pace, in spite of, a bigger budget being allocated by the Iraqi Government for that sector. In addition, the rise in pass rates for students this academic year is a clear sign for this. In this regard, if we make a comparison of figures between the academic year of 1991-1992 and the academic year of 2016-2017. We see how much the education sector has improved. In those years, the number of students have risen from 534,962 students to a staggering 1,738,521 students. The number of teachers rose from 21, 389 to 136,302. And, the number of Schools also increased from 1,320 to 6,789 schools. Furthermore, the illiteracy rate has shrunk between the years 2004 to 2017 down from 34 percent to 15 percent. If we look thoroughly at the problems facing the Kurdistan Region today, it will become evident that better education, that is built on the pillars of scientific principles from the developed world, will, in no doubt, solve many of our current issues and will undoubtedly guarantee a better future for the society and for the coming generations. A developed and strong education system means a progressive and healthy society. We truly believe in this vision, that is why we continuously strive to improve the system of learning, as well as the quality of education and raising the level of learning and teaching. The empirical evidence shows that countries that focused on improving their education system after going through war and difficulties, have achieved prosperity and a better way of life and this is a clear sign for the impact of education. I would like to reaffirm here, by considering the current and future necessities of Kurdistan in reconstruction, development and preparing experts in vocational fields, the KRG will take necessary steps to improve vocational education in all fields, so we can rely on our own workforce and expertise in various fields in the Kurdistan Region. As a result, more job opportunities will be created and we will be less reliant on others in every field of work. For this reason, the Ministry of Education has taken necessary steps with a careful plan to make vocational education more appealing – which I personally believe is one of the most important part of education system and also to enable those who choose to study vocational courses to become active members of society and breadwinners for their families, and provide a better life and future for themselves and their families. Studies from UNICEF show that holding certificates in vocational fields will provide better opportunities for the future. One of the goals of this conference is to gain assistance and support from international organizations, donors, charities and the wealthy individuals for education sector. I also request them to support the education sector in the Kurdistan Region. It is true that KRG, as part of its educational improvement strategy, has focused on building schools which is better in comparison to previous years as the problem of school shortages have decreased. However, with the influx of IDPs and refugees from Iraq and neighboring countries, the problem persists. That is why, the participation of donors and the private sector in building schools will help the Government and will contribute to lifting the burden from the shoulders of the Government, the Ministry of Education, people and students. Prior to the financial crisis, there was a special fund and a national campaign for building schools, but because of the financial downturn, nearly 300 schools and education related projects are put on hold. Help of this kind, will result in relaunching such halted projects in the Kurdistan Region. It will help to reduce the overcrowding in students’ classes and will help to create an education friendly atmosphere for students and will provide a productive medium for learners. Some businesspersons and wealthy individuals have helped the education sector by constructing schools. Here I would like to thank them and applaud them, I hope we will see many more following suit. Furthermore, I request the Ministry of Education to arrange an appropriate special event for paying homage to those who contributed in helping the Government in that regard. I personally would like to be present in such event so I can thank them and encourage more people to follow their lead in the campaign of building schools. In the end, I would like to applaud the Ministry of Education for the successful academic year and the increase in the pass rates among students. Also, I would like to point out the important role that teachers play and their forbearance and patience. We all are aware of the leading role of teachers in preparing future generations. We also know the adverse impact the financial crisis has had on the living standards of teachers, but despite all that, teachers did not allow the process of education to be halted in the Kurdistan Region. Once more, I express my appreciation to the teachers and I also thank the Kurdistan Teachers Union for their intensified efforts in that regard. Again, I commend those revered teachers who didn’t allow the education system to be stopped and assumed their responsibilities despite all the difficulties, and I congratulate the students who passed this academic year.